"Thank you HawkStopper! This and my scare crow are working wonderfully together." "So far so good, net stretches well for good coverage. I've only seen raptors fly over, rather than perching contemplating which hen they think they'll get." given the fact that I haven't lost any more chickens, I'm assuming it had something to do with it." Learn how to set up your Hawk Stopper Visual Deflection Net. This bird netting for chickens stops hawks and other predatory birds by taking advantage of their super-sharp eyesight. Chicken coop roof netting that looks almost invisible to us, looks like impenetrable iron bars to them! This chicken coop hawk netting is perfect for yard use. 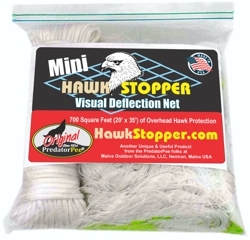 HawkStopper - Size when Stretched: Approximately 20' x 75' - Mesh 5"x 7"
This hawk deterrent for chickens was first used to protect salt-water salmon farms in the Gulf of Maine from predatory sea birds. 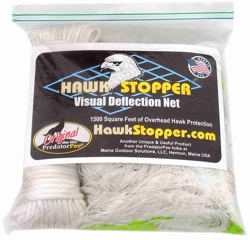 Hawk Stopper now uses the same principles of visual deflection to protect free-range chickens, turkeys and ducks as well as koi, catfish and other inland pond or farm-raised fish. 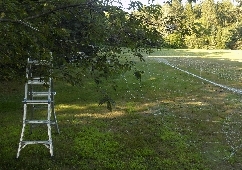 Visual Deflection Net - 1500 sq ft (approx. 20'x75') - Includes 100 feet of rope for installation! The HawkStopper Hat tells everyone where you stand in the fight against predatory birds. Hat is embroidered with HawkStopper.com logo and is very comfortable - one size fits all. Hawk Stopper more than you need? By popular demand, Mini-Hawk Stopper is here. The same concept in a smaller size. 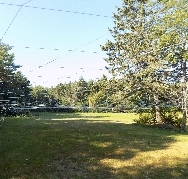 Visual Deflection Net - 700 sq ft (approx. 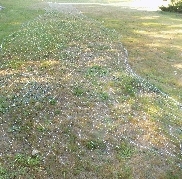 20'x35') - Still includes 100 feet of rope for installation!